In our days, general perception about the imminent apocalyptic future is explained through, and as a consequence of a multicultural issue. The link between multiculturalism and apocalypse has to do with us realizing that while we are so egocentric in placing the human as a measure of all things, everything around us is dying. The so-called vast majority of humans seem convinced that the neoliberal globalization process of hegemonic multiculturalism has failed. What if we were to look at the future from a multi-natural perspective instead? Hence, what is multi-natural? An easy answer would be the opposite of multiculturalism: The ancient belief that most existing entities are supposed to share a similar inferiority while being different in a body. And the guy who came up with all this is Brazilian anthropologist Eduardo Viveiros de Castro, who made this hypothesis when he encapsulated indigenous conceptions that were already present in a range of Amerindian people from the Lowland South. Modernity was possible through genocide not only on the indigenous human population but also plants, animals and entire ecosystems, that were extinct by the carbon cannibalism, fracking, radioactive spills and many other “revolutionary” actions. As it is, the emancipation of our species equals solitary supremacy and is not making anyone happy anymore. After all, is turpentine that far away from gin? 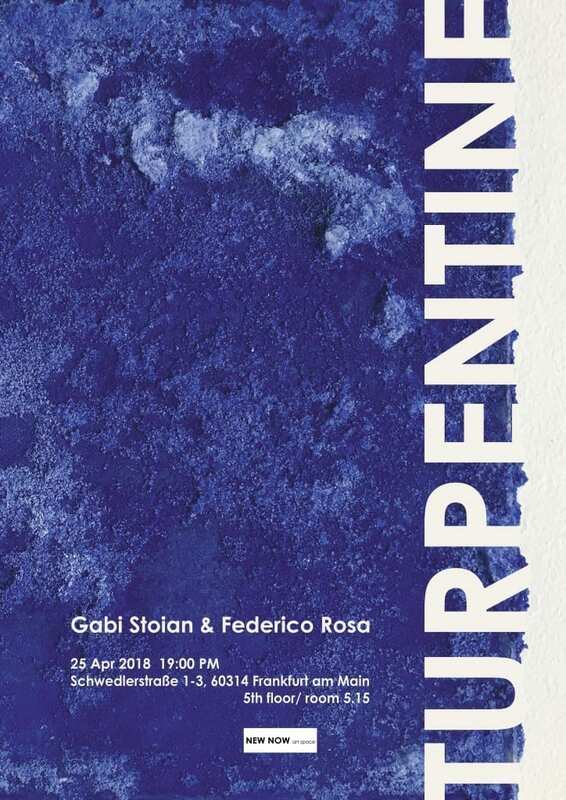 The works presented in this show by the two distinct artists, Gabi Stoian – Romania and Federico Rosa – Honduras, find common ground in the attempt to outgrow contemporary aesthetic trends. Going as far away from the understanding of art through art history, and following the belief that the future art can no longer be referential, it has to be free from the chains of logic and the never-ending ties to modernity. This exhibition offers a downgrading perspective on things to come rather than an elevation of humanity. However this display is not intended to be seen as negative or solipsistic, just sceptical, a focus on positive conditions required for constructing new perspectives. – Curatorial text 2018. Gabriel Stoian – graduates from the University of Art and Design in Cluj-Napoca in 2014 obtaining a PhD diploma in visual arts and gives his debut as an aspiring artist in the same year. His first exhibition will take place in Bucharest’s ALERT studio (white code), followed by numerous activities in the local art scene and on an international level: Vienna Art Fair ALERT Studio, 2014; Bucharest Biennale 2014; Multimedia Center for Visual Arts, Bucharest 2015; Lateral ArtSpace, Brush Factory, Cluj-Napoca 2015; Group exhibition, Melkweg Expo Center, Amsterdam, 2015; Videozoom: Romania, group exhibition, Museo di Roma 2015; Supermarket Art Fair – Lateral ArtSpace, Stockholm, 2015, solo show – RKI gallery, Berlin, 2016. Currently, Gabriel Stoian lives and works in Frankfurt and Bucharest and has devoted himself to the visual arts of an interdisciplinary activity based on the means of the experiment and independent research. Federico Rosa was born in Honduras and educated in England. He attended City and Guilds of London Fine Arts School and graduated with a Bachelor of Arts in Fine Art PAINTING. For his Master of Arts SCULPTURE, he attended the Slade School of Fine Arts, also in London in 2005. After graduation, he moved to Honduras to become a teacher and run an independent artist’s space until 2011. He has been a Frankfurt-based artist since 2013. He has exhibited most recently in New York City with Alyssa Davis Gallery, Atelierfrankfurt, Frankfurt, and Museo Para la Identidad Nacional in Honduras. His work alternates between political paintings done in stark black and white, grotesque, absurdist sculpture and video, and more recently, satirical abstractions based on the styles and ideals of Euro-American modernism. NEW NOW art space is an artist-led studio, exhibition and project space based on the fifth floor, room 5.15 of AtelierFrankfurt in Frankfurt, Germany. It was founded in 2016 and is coordinated by Gabriel Stoian, a Romanian artist. The space works as a dual platform, alternating on private production and conducting a dynamic program open to exhibition projects, workshops and interdisciplinary research supporting national and international emergent artists. 60314 Frankfurt, 5th floor, room 5.15.